Newly-released police body cam video shows a Bay Area Rapid Transit passenger scuffling with BART officers during an arrest. The incident happened back in July when BART officers responded to reports that a passenger who was possibly armed tried to rob another passenger. Other witnesses disputed the report, saying the reporting party called police after some sort of diagreement with the passenger. Video of the violent arrest was released Wednesday by the San Francisco Public Defender’s Office. The passenger, Michael Smith, was acquitted last week of battery on an officer. He was not armed during the confrontation. The video shows officers with guns drawn confronting Smith as he steps off a train at Embarcadero Station. Smith is seen struggling with officers who forced him down, pinning him on his stomach. 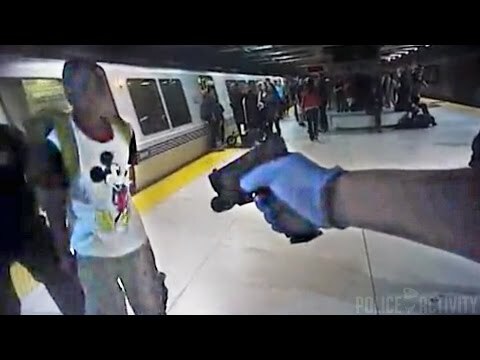 BART officials said Smith bit, kicked and spit on the officers. Smith looked to be relatively calm until an officer also took down a woman he was with, keeping a knee in her back even after being informed she was pregnant. After repeatedly stating she was pregnant, the officer gets off her and helps her to her feet. In the video, Smith continues to struggle with officers even as he is restrained and at one point, he spits at an officer who responds by punching Smith in the face. Trost said Smith was not cooperative during the arrest and the reporting party had said he believed Smith was armed. Adachi argued in court that Smith had a reasonable response to the excessive force used by police against him and his companion after they had been racially profiled. Trost maintained in her statement that BART Police is now on the forefront of training to deal with racially-charged situations. “BART Police is a progressive agency and has been on the forefront – and in some cases the model approach – to training in the areas of fair and impartial policing, bias-based policing, crisis intervention, cultural competence training, and de-escalation training,” she said. Tagged bart, bay area rapid transit, Police Body Cam Video Of San Francisco BART Station Arrest, Train. Bookmark the permalink. Yes, please keep shooting this tweakers and punks. The police do a good job, support the boys in blue and let them rid the world of bart rodents.